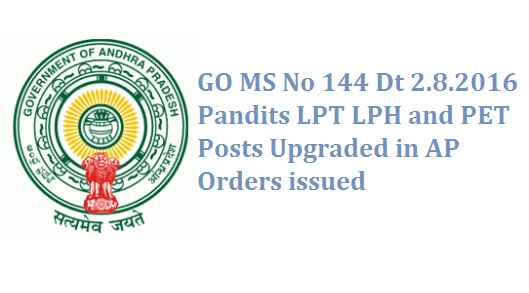 GO MS No 144 Pandit PET Posts Upgraded in AP Andhra Pradesh SCHOOL EDUCATIONDEPARTMENT – Upgradation of Language Pandit Grade -II and Physical Education Teachers working in ZillaParishad/Government High Schools to the cadre of School Assistants- Sanction – Orders – Issued. In the reference first read above, orders were issued according sanction for upgradation of 1500 Language Pandit posts as School Assistant (Languages) and 500 Physical Education Teacher posts as School Assistant (Physical Education) in Success Schools in the State by suppressing 102 Secondary Grade Teacher (SGT) posts.The Commissioner and Director of School Education on the request of Teacher Associations recommended for upgradation of posts of Language Pandits Grade -II and Physical Education Teachers working in ZillaParishad/Government High Schools to the cadre of School Assistants for parity with the other subject teachers working in the High Schools since as per the service rules the qualifications required for the post of School Assistants (Languages) and Language Pandits are same and both are working in the Upper Primary Schools and High Schools. Moreover, there are no Second Grade Teacher(SGT) cadre posts in the High School pattern, the Language Pandits are equivalent to Second Grade Teachers but are teaching in High Schools. Accordingly, in the reference second read above the Director of School Education, Hyderabad has requested forupgradation of1450 posts of Language Pandits and 1200 posts of Physical Education Teachers as School Assistants in case of High Schools having a strength of 200 students and above throughout the State in the first phase. The Government after careful examination of the proposal hereby accords sanction for up-gradation of1450 posts of Language Pandits Grade -II and 1200 posts of Physical Educational Teachers working in ZillaParishad / Government High Schools as School Assistants in the pay scale of Rs.28940-78910 in case of High Schools having a strength of 200 students and above throughout the state in first phase. The School EducationDepartment shall take further necessary action in the matter accordingly.